Chinese manned spacecraft. 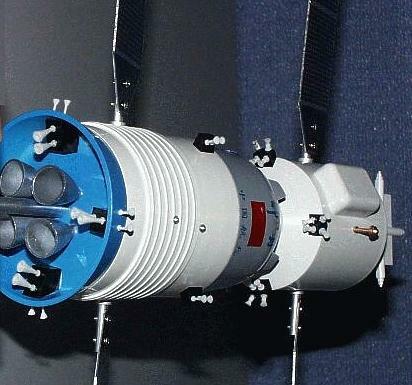 The Chinese Shenzhou manned spacecraft resembled the Russian Soyuz spacecraft, but was of larger size and all-new construction. AKA: Project 921-1. Status: Operational 1999. 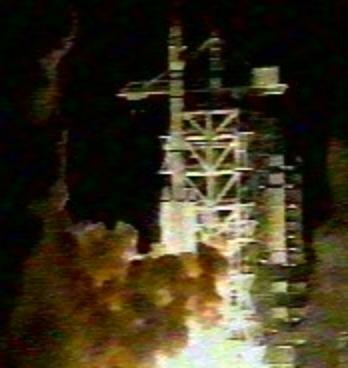 First Launch: 1999-11-19. Last Launch: 2013-06-11. Number: 10 . Thrust: 10.00 kN (2,248 lbf). Gross mass: 7,840 kg (17,280 lb). Unfuelled mass: 6,840 kg (15,070 lb). Specific impulse: 290 s. Height: 9.25 m (30.34 ft). Diameter: 2.52 m (8.26 ft). Span: 17.00 m (55.00 ft). Like the Soyuz, it consisted of a forward orbital module, a re-entry capsule, and an aft service module. Unlike the Soyuz, the orbital module was equipped with its own propulsion, solar power, and control systems, allowing autonomous flight. Shenzhou would be used to develop manned spaceflight techniques (extravehicular activity, rendezvous and docking) and later serve as a ferry to Chinese space stations. Like Soyuz, derivatives could be used as a lunar orbital and landing spacecraft. The Shenzhou project received limited funding, resulting in a protracted development program. Work began in 1992, with annual unmanned flights finally beginning in the winter of 1999/2000. The development of Shenzhou's thirteen sub-systems took the effort of thousands of engineers and technicians in 300 organizations in China. The first manned flight came in the autumn of 2003. The Chinese perfected ballistic re-entry vehicle techniques very early in their space program. The abortive Shuguang-1 project to launch a Chinese man into space was cancelled for political reasons in 1972. 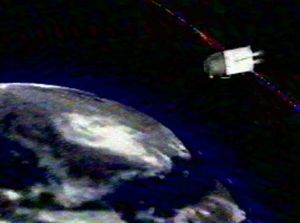 The FSW unmanned reconnaissance satellite began a series of successful recoveries in 1976. Nevertheless low-key development work on manned spaceflight continued. In 1978 photos were released showing Chinese astronauts in impressive space suits being trained in altitude chambers and at the controls of an elaborate space shuttle-like cockpit. A fleet of ships for recovery of capsules at sea was built. In May 1980, a ballistic missile re-entry vehicle was recovered from the South Pacific after a sub-orbital launch. But in December 1980 Wang Zhuanshan, the Secretary General of the New China Space Research Society and Chief Engineer of the Space Centre of the Chinese Academy of Sciences, announced that Chinese manned flight was being postponed because of its cost. After a ten-year hiatus, China began preliminary work on manned spaceflight again in July 1985. The decision came against a background of vigorous international space activity. The United States had its Strategic Defense Initiative and Space Station Freedom. The Soviet Union had its Buran shuttle system, Mir and Mir-2 space stations, and its own star wars program. Europe was developing the Hermes manned spaceplane, and Japan the Hope winged spacecraft. Even India and China were taking on ambitious space projects. It seemed China would have to take action to remain a world power. Ren Xin Min, the leading Chinese rocket expert of the time, believed that China should make a space station its national goal. This would develop all aspects of space technology, including modern launch vehicle capabilities. In early spring 1986, members of a standing committee of the Chinese Academy of Sciences (Wang Da Hang, Wang Ganchang, Yang Jiachi, Chen Fangyun) proposed a family of seven Project 863 plans to accelerate Chinese technical development. These numbered plans covered biology, astronautics, information technology, military technology, automation, energy, and materials science. Astronautics plan 863-2 included a section 863-204 space transportation system, which would service a section 863-205 space station. It was estimated that two years would be needed for concept studies. An expert group was established for the 863-204 shuttle, and issued a tender call to Chinese industry within two months of starting work. Sixty days later 11 alternate proposals were delivered, of which six were selected for feasibility studies. These were delivered in June 1988. The proposals ran the gamut from highly advanced two-stage-to-orbit reusable space shuttles to modest ballistic capsule designs. The latter proposal was from Department 508 of the Fifth Academy (now the Chinese Academy of Space Technology, CAST). They proposed a manned space capsule, recovered by parachute, similar to the Soviet Soyuz spacecraft. Department 508 argued that the Chinese industrial and technical base was not realistically up to developing winged reusable spacecraft, and that this would take a very long time and would not be flying until well into the 21st Century. 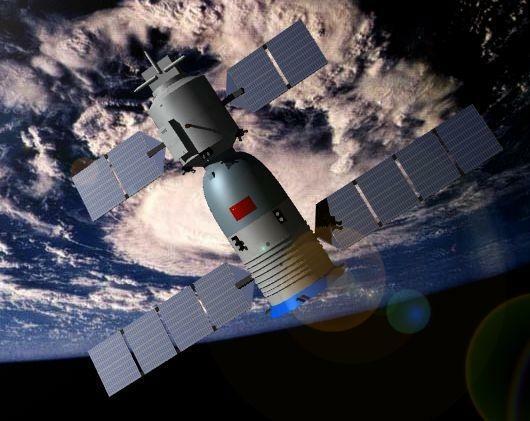 A capsule should be developed in any case as a lifeboat for the space station, and would provide a Chinese manned space capability by the year 2000 - and until a winged spacecraft was available. 17 experts met in Harbin during 20-31 July, 1988, to make final assessments and recommend a course of action. It finally concluded that development of a winged reusable space shuttle system was acceptable as a national long-term goal to guide technology development. But China did not have the aerodynamic or rocket technology to develop a hypersonic aircraft with reusable rocket engines. The two designs that were considered technically achievable ranked very close in the expert's rating system - the Tian Jao 1 manned spaceplane with a score of 83.69, and the Department 508 manned space capsule with a score of 84.00. The space capsule advocates pointed out that the development cost would be relatively modest, since China already had the boosters to launch it, and had proven ballistic capsule re-entry and recovery technology. They repeated that such a capsule would in any case be needed as a lifeboat for a Chinese station, and that the capsule would be safer and more reliable than a spaceplane design. The Chinese aeronautical industry in fact did not have the existing technical base to build a true supersonic cruise aircraft, let alone a hypersonic aircraft. The spaceplane advocates pointed out that the space capsule approach did little to advance the Project 863 objectives of leapfrogging Chinese technology to a world-class 21st Century level. Indeed China might even invite international contempt by flying a 1960's-type design. The report failed to impress the government. Chinese leader Deng Xiaoping rejected both plans, saying that neither could be flying in his lifetime. The Chinese space establishment went back to the drawing board. Deng stepped down as Chairman of the Central Military Commission in 1989. In his absence the Chinese military decided it could safely lend its critical support to a manned space program. 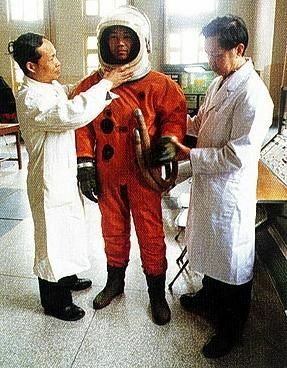 In January 1991 the Air Ministry established a manned space program office with Liu Jiyuan as its head. After that things moved quickly. On 15 March 1991 Project 863 leader Ren Xin Min was called to a meeting with Premier Li Peng. Ren Xin Min presented a more modest manned space development plan, using the existing Long March CZ-2E booster to launch a manned ballistic capsule into orbit. There was no longer any mention of development of hypersonic reusable winged space shuttles. Li Peng was especially gratified to see the funds previously spent on the Long March rocket being put to good use, and work on the project began in earnest. 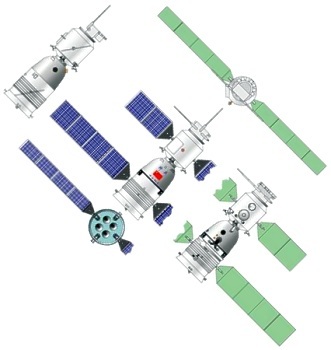 The First Academy (now CALT, the China Academy of Launch Technology) proposed a three-module design like that of Soyuz. However it differed critically in that the orbital module was larger and capable of autonomous flight after the conclusion of the mission. Leader of the design team was Ren Xin Min. The Fifth Academy (now CAST, the China Academy of Space Technology) considered three alternative configurations. One was a three-module Soyuz-type design, with a forward orbital module, a central re-entry vehicle, and an aft service module. The second had the re-entry vehicle forward, with an orbital module at the center, and a service module aft. Access from the re-entry vehicle to the orbital module was via a metal tube, which ran externally from a hatch in the re-entry vehicle to the orbital module (the solution used in the American MOL, and Soviet Soyuz VI and TKS - a hatch in the heat shield - was evidently considered unacceptable). The third design had just two modules, a larger re-entry vehicle forward, and a service module aft. 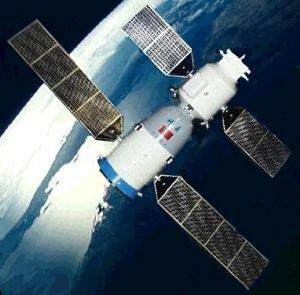 The Eighth Academy (now SAST, the Shanghai Academy of Spaceflight Technology ) also proposed a three-module design. The final plan was approved on 21 September 1992, and Project 921 to create a Chinese manned space capability began in earnest. Wang Yongzhi was made responsible for overall project management. At CAST, Qi Faren was responsible for the spacecraft itself. The design of the service module was assigned to SAST under Qi Faren's direction. CALT was to design the CZ-2F man-rated modification of the CZ-2F. Wang Yongzhi was responsible for much more than just the development of a new spacecraft and modified booster. Implementing the program required modernization of the Chinese technology base and infrastructure, and this was in fact its main purpose. 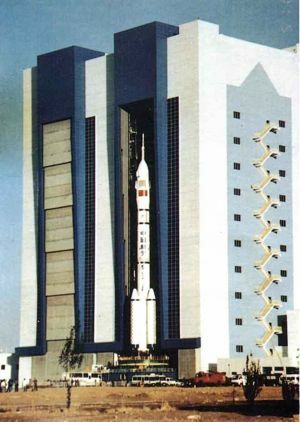 A complete new technology vertical assembly building, mobile launch vehicle transporter, and launch pads had to be built in Jiuquan (Xu Kejun chief designer). An integrated approach to recovery of the manned spacecraft, including land, sea, and air vehicles, was developed by Zhao Jun for use in the primary landing zones at Siziwangqi and Alashanyouqi in Inner Mongolia. A new unified S-band spacecraft tracking and control network was developed under the leadership of Yu Zhijian. This included new tracking sites outside of Chinese territory, a new tracking ship, the upgrade of existing tracking stations and ships, and a new flight control center in the north-east suburbs of Beijing. Astronaut training and crew technology was non-existent in China, and this capacity was developed by Shu Shuangning at the Aerospace Medical Engineering Research Institute. Of the total $2.3 billion program cost through the first manned flight, $ 1.0 billion went to infrastructure. A rearguard action was fought to try to include new booster development. In October 1993 the Shanghai Astronautics Bureau proposed development of six large carrier rockets and eight new spacecraft, including a manned one, for inclusion in the Eight and Ninth Five Year Economic Plans. But this was not approved. 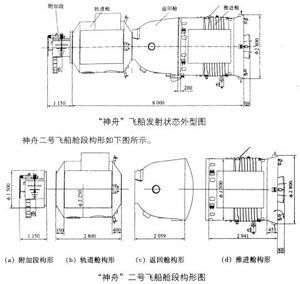 Shanghai's program for development of a new generation of liquid oxygen / kerosene rockets was shelved, and those resources were instead put into the development of large solid motors for military use. 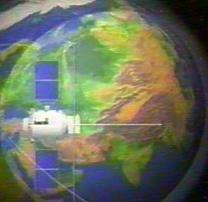 Russian assistance to the program began as early as May 1991, when Russian lecturers briefed the Chinese engineers on the capabilities and potential of their Soyuz spacecraft. This was followed by two-year fellowships for 20 young Chinese engineers in Russia during 1992-1994. 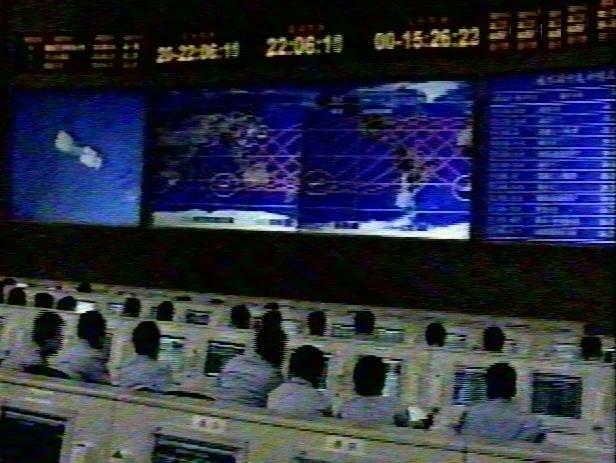 In September 1994 Chinese President Jiang Zemin visited the Russian Flight Control Centre in Kaliningrad and noted that there were broad prospects for co-operation between the two countries in space. In March 1995 a deal was signed to transfer manned spacecraft technology to China. Included in the agreement were training of cosmonauts, provision of Soyuz spacecraft capsules and life support systems, androgynous docking systems, and space suits. In 1996 two Chinese astronauts, Wu Jie and Li Qinglong, began training at the Yuri Gagarin Cosmonaut Training Centre in Russia. After graduation these men returned to China and began selection of a cadre of 12 Chinese astronauts. Design was completed in August 1995 and construction began of four ground-test prototypes of the spacecraft - two structural test versions, one thermal test model, and an electrical test vehicle. Many difficulties were encountered. The Chinese had been quoted what they considered exorbitant prices to acquire key Russian technology, and in those cases they had to develop their own solutions. Even the decision to use an enlarged aerodynamic copy of the Soyuz capsule did not mean extensive development testing was not required. Characterizing the heat shield performance of the capsule, particularly around the critical porthole areas, required testing at TsNIIMASH facilities in Russia in the summers of 1995, 1998, and 1999. Welding and sealing of the re-entry vehicles frame encountered numerous difficulties, as did SAST's qualification testing of the propulsion systems and service module. Tests of the launch escape system in April and August 1995 were failures, and first succeeded only in April 1997. But the successful design was 900 kg overweight, and a weight reduction program was necessary. In May 1998 a mock-up of the CZ-2F launch vehicle and Shenzhou spacecraft were rolled out for facilities tests. The first completely successful test of a production-weight launch escape system was finally accomplished on 18 October 1998. In June 1999, coincident with public announcements that the first unmanned test of the spacecraft would be made in October, photographs of the CZ-2F launcher with a Soyuz-style shroud appeared mysteriously on the Internet. They were said to have been scanned from a brochure of an Inner-Mongolian construction company that had worked on the launch facilities. The shroud was consistent in shape and size with that portrayed in the 1992 drawing of the cancelled Shanghai lox/kerosene launch vehicle. It had many similarities with Russian Soyuz shrouds, but comparison with photos of Soyuz shrouds to the same scale showed it to be much larger. In July, completion of the fourth Yuan Wang tracking ship was announced, ready for deployment with its three sister ships in October. Then in early August rumors spread in the Far Eastern press of a propellant explosion in Jiuquan that involved manned spaceflight hardware. This was denied by Chinese officials a few days later, but suddenly the predicted date for the first unmanned launch of the Shenzhou changed from October to 'sometime in 1999'. In fact the program was encountering serious delays, and the only way to make the deadline of the first unmanned launch by the end of 1999 was to take the ground electrical test model of the spacecraft and fly that in space. So the first Shenzhou would have functioning service module and re-entry vehicle, but the orbital module would be a nearly inert mock-up. The experiments being flown originated from Mr. Qin Yi of the Oriental Scientific Instruments I&E Group. The project was administered at Star City by Mr. Yuri L. Bogoroditsky, Chief of Foreign Economic Development, Gagarin Cosmonaut Training Centre. The possibility of an imminent launch was signaled by the departure of the four Yuan Wang tracking ships from their home port. Three of the ships were stationed in the southern hemisphere near latitude 35 S: one off the coast of Namibia, one off the south-west coast of Australia, and one in the mid-Pacific on the International Dateline. The fourth ship was off the southern coast of Japan (for tracking the end of the launch phase and recovery of the capsule in the case of an abort). Land-based tracking sites were located at the Jiuquan launch site, West China, South Africa, and Pakistan. 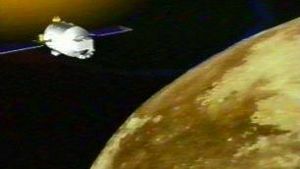 The unmanned first test flight of a prototype of the Chinese Project 921-1 spacecraft took place 49 days after the planned date of October 1, 1999. 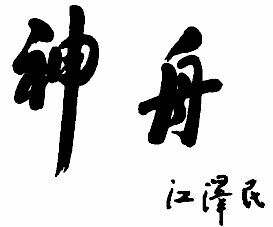 Chinese President Jiang Zemin personally named the spacecraft 'Shenzhou' (variously translated as 'Vessel of the Gods', 'Divine Craft', 'Divine Mechanism'; but also a play on a name for China). Film released of the flight verified the existence of the new man-rated CZ-2F launch vehicle, its vertical assembly building, and showed the true configuration of the spacecraft for the first time. Despite rumors at several points during the following year, the next unmanned test did not occur until January 2001. The second flight carried a monkey, a dog and a rabbit in a test of the spaceship's life support systems. Shenzhou 2 demonstrated multiple restarts of its propulsion system and made three orbit-raising maneuvers during its flight. After seven days in orbit, the descent module and service modules separated from the forward orbital module. 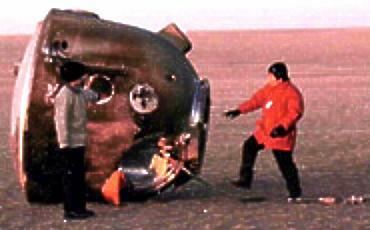 After retrofire by the service module, the descent module separated and landed in Inner Mongolia. Lack of post-recovery photographs led to speculation that the recovery may have been unsuccessful. Again the orbital module continued in controlled orbital flight, conducting zero-gravity experiments. 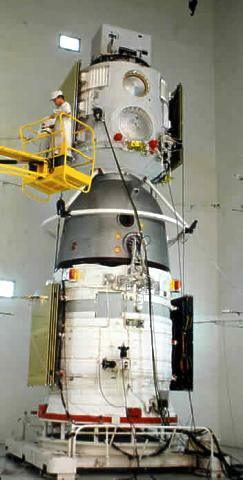 The second Shenzhou saved 100 kg in mass using a new wire harness mounting technique. 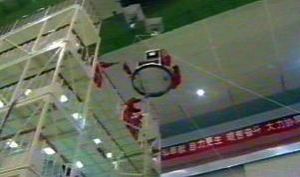 Training of the Chinese astronauts was reported to be proceeding with commissioning of a unique form of zero gravity trainer. 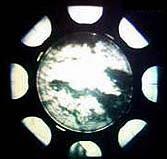 The consisted of a chamber, 15 m in diameter and 21 m high, installed in a vertical wind tunnel. Wind speeds of up to 150 km/hour levitated the astronaut trainees. Shenzhou 3 was launched in March 2002 and the program pace began to pick up. This was the first launch with a live launch escape system. Shenzhou 4, launched in December 2002, was the final dress rehearsal for a manned launch. Even the crew for the first manned flight were placed in the capsule, and went through all procedures up to a certain point in the countdown. They then left the capsule, and the mission proceeded unmanned. All systems checked out perfectly, and China was poised for its first attempt at a manned flight in October 2003. And what was the cost of all this? In 2003 the president of the company that builds the Shenzhou capsules, Zhang Qingwei, told a Chinese newspaper that Beijing had spent about $2.3 billion on its manned space program in recent years. The spacecraft strongly resembled the Russian Soyuz spacecraft, and like the Soyuz, consisted of a forward orbital module, a re-entry capsule, and an aft service module. 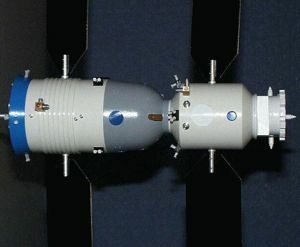 The configuration was very much like the original Soyuz A design of 1962 (itself, in turn, alleged to be very similar to the US General Electric Apollo proposal of the same period). Horizon sensors were located at the middle bottom of the service module, as on the Soyuz spacecraft. Two pairs of solar panels on the service and orbital modules had a total area of 36.72 square meters, with a maximum power output of 3.5 kW, and an average electrical power of over 1.45 kW (nearly three times that of Soyuz and about that of the original Mir base module). Unlike the Soyuz, the orbital module was equipped with its own propulsion, solar power, and control systems, allowing autonomous flight. The orbital modules could be left behind as autonomous space laboratories. A stretched version would provide an 8-metric ton space laboratory for use in Project 921 Phase 2. In Phase 3 of Project 921 the modules could be left attached to the 20-metric ton space station as additional station modules. The basic spacecraft was capable of manned missions of up to 20 days, with autonomous missions of the orbital module of up to a year. Within the cabin of the spacecraft, maximum noise level was 125 dB during launch and re-entry, and 75 dB during in-orbit operation. Maximum G forces were 4 G's during normal lifting re-entry, 11G's during an uncontrolled ballistic re-entry, and 17 G's in an emergency abort. 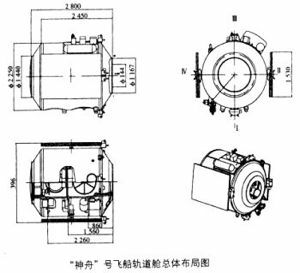 Detailed descriptions of each of Shenzhou's three modules are provided below. The escape tower would fire to pull the Shenzhou capsule and orbital module away from the booster in the event of a major booster malfunction from 15 minutes before launch to the point of payload fairing jettison at T+160 seconds. The system consisted of the escape tower, the upper portion of the payload fairing, and the orbital and descent modules. This complete assembly had a total mass of 11,260 kg, and was 15.1 m long and 3.8 m in diameter. The system was designed for a reliability of 0.995. The tower itself was 8.35 m long and equipped with six solid propellant motors. These consisted of four axial vernier motors, a low altitude separation motor with eight nozzles, and a medium altitude escape motor with four nozzles. In the upper shroud were four motors used for escape at high altitude, and two motors used for shroud separation. Four grid-like aerodynamic flaps on the upper shroud stabilized the assembly during an abort. From launch to 39 km attitude, at T+120 seconds: The upper shroud, together with the orbital module and re-entry vehicle of the spacecraft, would be pulled away from the lower shroud, service module, and failing booster by the escape tower. The low- or medium-altitude escape motors of the escape tower would be used as appropriate to the flight regime. From T+120 seconds to T+160 seconds, after separation of the escape tower, the high altitude escape mode would be used. This used solid propellant motors in the upper shroud to pull the orbital module and re-entry vehicle away from the booster. After T+160 seconds, and jettison of the spacecraft shroud, an abort would consist simply of booster shutdown, separation of the re-entry vehicle, and an emergency re-entry leading to a recovery either on Chinese territory or off the southern coast of Japan. Service Module, developed by the Shanghai Academy of Space Technology, provides the electrical power, attitude, control and propulsion for the spacecraft in orbit. Within the service module there were several ellipsoid-shaped compartments that housed avionics, electrical, and environmental control system equipment. Also located in the service module were the nitrogen and oxygen gases for the environmental control system. These were stored in steel alloy spheres at a pressure of 21 Mpa. To reject the 1 kW of heat generated by Shenzhou's crew and internal systems, a cooling system used heat pipes to conduct heat from internal systems to the external radiator. Primary electrical was provided by the two solar panels, which had a total area of 24.48 square meters. 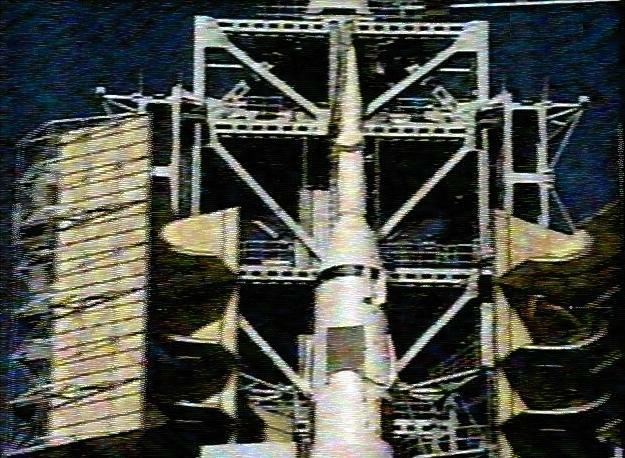 Each panel was in four sections, which were folded during launch. The two panels on the orbital module were of two sections each, and provided an additional 12.24 square meters of panel area. The back surface filled silicon solar cells of the arrays had an efficiency of 14.8%. Sun sensors between the panels measured the sunlight incidence angle which allowed the panels to be automatically commanded to an optimum angle. Silver-zinc batteries in the service module could provide six hours of emergency power in case of failure of the solar arrays. The spacecraft's power bus operated at 28 V and a peak power of 3.5 kW. Four large expansion ratio main engines at the base of the spacecraft, with a thrust of 2.5 kN each. Specific impulse was 290 seconds. Burn time at retrofire would be about 75 seconds. Eight 150-N high-thrust pitch and yaw thrusters arranged in four pairs on the inside of the flared based of the service module. Eight low-thrust 5-N pitch and yaw thrusters arranged in four pairs on the outside of the flared base. These could also, when used together, provide reverse thrust. Eight low-thrust 5-N roll / translation thrusters mounted four pairs at the spacecraft centre of gravity, just below the re-entry capsule. These were not placed at ninety degree intervals but in two pairs at each side of the spacecraft, allowing use for translation in the vertical axis only. 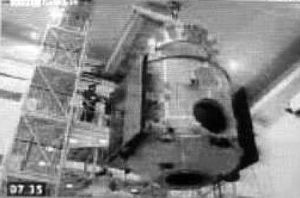 During orbital flight four groups of four 5-N thrusters mounted at the base of the orbital module were also available. This separate system used hydrazine monopropellant, pressure-fed at 23 Mpa from a 7-litre titanium cold gas tank. They were primarily used for autonomous attitude control and maneuvering capability to the orbital module when in free flight after Shenzhou's manned mission was completed. However they also could provide a backup to the main orientation system on the service module. Used in conjunction with the canted low thrust pitch and yaw thrusters at the base of the service module they could also provide translation in both horizontal and vertical planes during docking operations. RCS Coarse No x Thrust: 8 x 150 N. RCS Fine No x Thrust: 16 x 5 N. Electric System: 2.40 kWh. Electric System: 1.00 average kW. Gross mass: 3,000 kg (6,600 lb). Unfuelled mass: 2,000 kg (4,400 lb). Height: 2.94 m (9.65 ft). Diameter: 2.50 m (8.20 ft). Span: 17.00 m (55.00 ft). 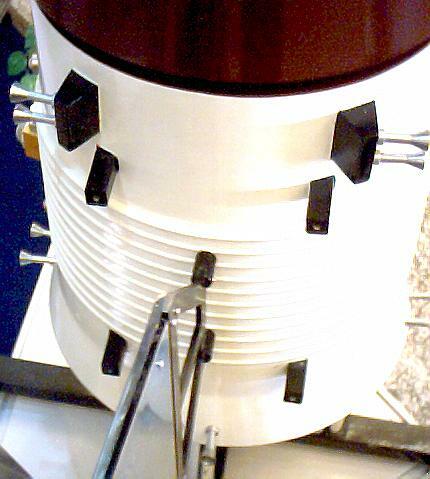 Thrust: 10.00 kN (2,248 lbf). Re-entry Vehicle, conceptually based on the Soyuz capsule, but 13% larger dimensionally, using the Soyuz 'headlight' aerodynamic form. The Shenzhou capsule used the same landing technique as Soyuz. The capsule deployed a single drogue, followed by a single orange-and-white main chute. The soft landing system (heat shield jettison, followed by ignition of soft landing rockets just before impact) was another Soyuz trademark. The Cox Report asserted that the Russians provided the Chinese with a complete Soyuz spacecraft. After the launch press reports quoted "high-ranking Russian space officials" as saying that China purchased a Soyuz re-entry capsule from RKK Energia in the mid-1990's in a private deal. However the capsule supplied contained a minimum of actual hardware. Unlike the Soyuz, the umbilical to the service module differed in detail and appeared to enter the capsule higher up on the main body. 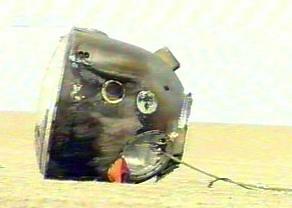 The capsule provided Soyuz-style molded seats for three crew. The astronauts were presented with modern flat-panel display instrumentation. 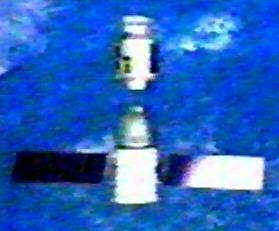 A Russian-type Vzor optical device provided a means of manually orienting the spacecraft for retrofire. Unlike Soyuz, it did not function as a periscope, and provided no forward view during docking operations. Manual control of the spacecraft was via Soyuz-type hand controllers. The structure of the re-entry vehicle used a titanium frame, with aluminum alloy sidewalls, base, and pressure vessel. 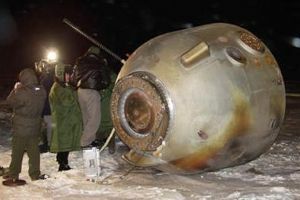 The module had the Soyuz classic 'headlight shape', with a diameter of 2.517 m and a length of 2.500 m from the forward hatch lip to the base of the heat shield. The crew entered and exited through a hatch around 70 cm in diameter at the top of the capsule. Two small portholes, around only 30 cm in diameter, provided a limited view outside. The optical device used for orienting the spacecraft manually for re-entry was similar to the Russian Vzor, but with a larger aperture. It featured eight side ports for ensuring the spacecraft was correctly aligned for retrofire. Since it did not function as a periscope and provided a view forward, future docking activities would require use of television or control of the spacecraft from a separate station in the orbital module. The interior space of the capsule was limited to six cubic meters by the housings for the main and back-up parachutes. There were three crew sheets, facing a high-technology control panel consisting of an array of flat panel screens, caution warning panels, annunciator panels. The integrated digital display system consisted of two multi-functional color LCD displays, fed from redundant controllers. The LCD panels were high resolution, capable of displaying complex graphics. Maps of any point of the world, either the current location of the spacecraft or that of possible landing zones, could be called up at will. A voice synthesizer was integrated into the caution and warning panel to alert the crew audibly when there was any deviation to normal operations. The cabin interior was lit by individually-adjustable fluorescent lamps. Arranged on the exterior of the capsule were six antenna mounts, the exhaust nozzles of the attitude control system used during re-entry, and a Soyuz-like patch panel for connection of gas, liquid, electrical, and electronic services from the service module. Most cabin internal equipment was installed beneath the three crew seats. From left to right these seats would be occupied by a payload specialist, a commander/pilot, and a copilot/flight engineer. Each crew member was provided with a space suit derived from the Sokol suit used aboard Soyuz; a survival suit for post-landing situations; underwear; coveralls for working in the cabin during the mission; a headset; medical monitoring sensors; a personal survival kit, an individually-contoured seat liner; and a sleeping bag. Each crew member's survival kit contained his selection of space food for the mission, optimized for the Chinese palate. Reserves of food were kept in case of unplanned mission extensions. There was even food in tubes that could be consumed while sealed up in the spacesuit in the event of extended cabin depressurization. The survival kit also contained a personal emergency radio beacon, smoke generator, signal rocket, flash light, dye marker, mirror, compass, life raft, pistol, knife, shark repellent, lighter, first aid kit, and emergency water. The medical monitoring system recorded each crew member's pulse, respiration rate, body temperature and blood pressure. A medical kit provided medicines and simple instruments for in-flight emergencies and illnesses. The environment control system regulated supply of nitrogen and oxygen to control the cabin pressure, circulated and purified the cabin air, controlled the cabin temperature and humidity control, and included smoke and fire monitoring and removal provisions. The system kept the cabin atmosphere at 81 to 101 kPa, oxygen partial pressure at 20 to 24 kPa, humidity at 30% to 70%, and temperature at 17 to 25 deg C. During re-entry, cabin temperature could go up to 40 deg C. There was a spacesuit loop for keeping the crew alive using umbilicals connected to their spacesuits in case of cabin depressurization. Provisions for disposing of body wastes and unused food have not been explicitly described. The system was fed by steel alloy nitrogen and oxygen gas bottles, at pressure of 21 Mpa, located in the service module. A separate supply of gas bottles were mounted in the re-entry vehicle cabin for emergencies and during re-entry. Shenzhou radio systems used a number of new technologies including unified S-band, digital video and voice processing, remote control and voice encryption, GPS based orbit determination, ablative and microstrip antennae, and high capacity solid-state storage technology. The system had 17 antennae and operated in the C, S, L, UHF, VHF, and HF bands. 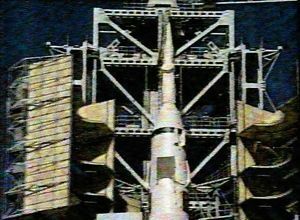 The in-orbit tracking and control subsystem had a GPS receiver, S-band transponders, a C-band single-pulse radar transponder, telemetry equipment and antennae. Data transmission was via a Unified S-Band System. This was compliant to international standards and combined telemetry, command, voice and video signals into one data stream. As a back-up voice and biomedical data were redundantly combined into a second data stream and transmitted through a VHF transceiver. Three rescue beacons aided in recovery. A 243 MHz VHF beacon started transmitting after the capsule left re-entry blackout, at 40 km altitude. An HF transceiver transmitted the capsule's precise location based on its GPS receiver, and also provided two-way analogue voice communications. A 406 MHz international Emergency Position Indicating Radio Beacon provided a method of locating the capsule in case it came down away from recovery forces. The crew also had handheld emergency 406 MHz transceivers. 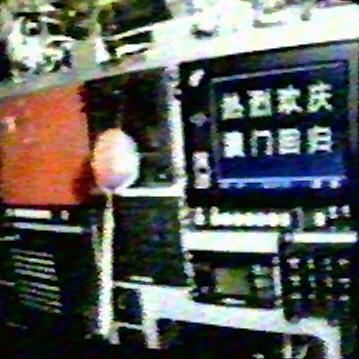 Shenzhou's 21 avionics black boxes communicated to one anther as a distributed computer network using a dual-redundant MIL-STD-1553B data bus. The Central Terminal Unit in the re-entry module controlled all three modules during flight. After retrofire and separation of the other modules it controlled the RV during re-entry. The Central Terminal Unit was a triple-redundant fault tolerant computer using majority voting to meet a Fail Operational -Fail Safe requirement. A second Central Terminal Unit in the orbital module was a dual-redundant computer. It would automatically come on line if the primary system in the re-entry vehicle failed. It also controlled the orbital module during autonomous missions of up to six months after the re-entry vehicle had returned to earth. Other avionics boxes on the bus included six single-board-computer based remote terminal units, two in each module, to collect data and transfer signals; a dual-redundant data transmission and control unit in the propulsion module; 11 interface units of other subsystems; and an emergency data recorder in the re-entry module. The latter had 10 MB of solid-state memory and was built to withstand 10,000 G's and a temperature of 1200 deg C for 30 minutes. To control orientation after separation of the orbital and service modules and during re-entry, the re-entry vehicle had eight 150 N thrust monopropellant hydrazine engines, pressure-fed from two rubber bladder tanks containing 28 kg of propellant. These were pressurized from two 4.5-litre titanium 23 Mpa gas tanks. Following re-entry, the landing system went into operation. 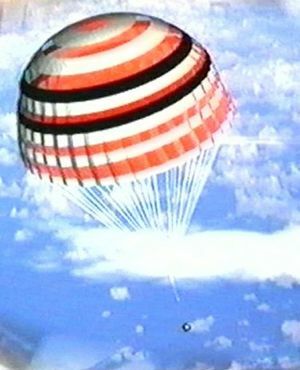 At an altitude of 10 km the parachute hatch was jettisoned, and two pilot parachutes deployed. These pulled out the drogue parachute, followed by the ring-sail main parachute, which had an area of 1200 sq m and a mass of 90 kg. In the event of a parachute failure, a back-up parachute with an area of 760 square meters was used. Deployment of the parachutes was guaranteed by an air-bag in the compartment (failure of the parachutes to be ejected from the compartment resulted in the death of Vladimir Komarov in Soyuz 1 in 1967). 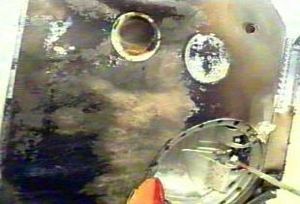 Below 6 km altitude the heat shield was jettisoned, exposing a gamma ray altimeter and the four nozzles of the soft-landing retrorockets. As the capsule approached the ground, the capsule converted from single-point to two-point suspension under the main parachute, and its vertical velocity declined to 8 m/s. The altimeter ignited four solid propellant retrorockets at one meter over the ground, reducing final impact velocity to 3.5 m/s. In case of failure, the crew seats were fitted with shock absorbers to guarantee an uncomfortable but survivable landing. After landing, a visual flashing beacon went into operation to assist recovery forces in locating the capsule at night. If the capsule splashed down in water, fluorescent dye was released into the water to assist sighting from the air. Crew Size: 3. Habitable Volume: 6.00 m3. Heat shield: 450 kg (990 lb). RCS Coarse No x Thrust: 8 x 150 N. RCS Propellants: 28 kg (61 lb). Gross mass: 3,240 kg (7,140 lb). Height: 2.50 m (8.20 ft). Diameter: 2.52 m (8.26 ft). Orbital Module. This provided quarters for the crew during the space mission, and could be fitted out with different internal and external equipment according to mission requirements. It also served as an airlock for external operations. The orbital module was jettisoned before retrofire. Early models were equipped with their own solar panels and propulsion for autonomous flight after separation. 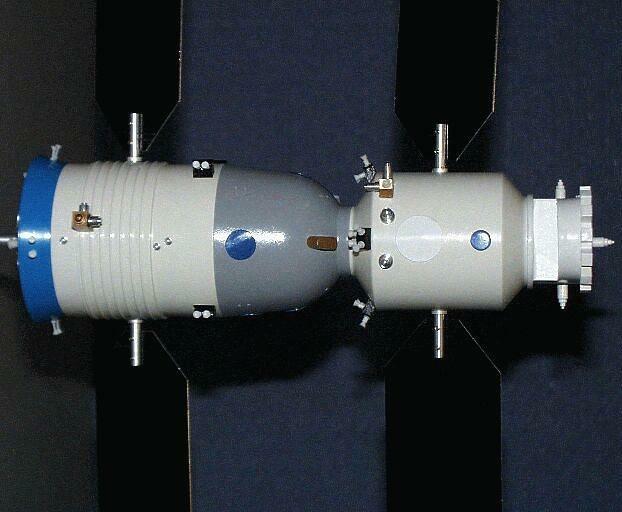 When Shenzhou was later used to shuttle astronauts to the Tiangong space laboratory or later larger, multi-module space station, the orbital module was fitted with a Russian-style androgynous docking system at the forward end of the orbital module, and the solar panels were eliminated. The module was a semi-monocoque aluminum structure, cylindrical, 2.250-m in diameter and 2.800 m long. This length did not include an equipment pallet mounted on the forward end, which varied from flight to flight. A large 80-cm-diameter EVA hatch was located in the lower portion of the module, with a 48-cm diameter porthole above that, very unlike Soyuz. A rectangular equipment package could be mounted on the opposite side of the orbital module. Also on that side was a second smaller window. The lateral sides of the module were used for mounting of the rotating solar panels when fitted. At the base of the orbital module was a 70-cm-diameter hatch providing access to the re-entry vehicle. Presumable a similar hatch would be located at the nose for docking missions. The equipment pallet varied from mission to mission. Shenzhou 1 and 2 flew with dummy or partial electronic intelligence packages, a complex arrangement of equipment mounted at the top of the orbital module. This included a semi-circular ring which provided mounting for rectangular instruments around its exterior. Three perpendicular 0.4 m extendible booms were deployed as well, part of an experimental magnetic attitude sensing and control system. Shenzhou 3 and 4 flew with the complete electronic intelligence payload mounted on the nose. As analyzed by veteran space-radio expert Sven Grahn, this consisted of two major components. UHF emission direction-finding was accomplished by three earth-pointing television-aerial type antennae deployed on long telescoping booms. These would function in the UHF band between 300 and 1,000 MHz, covering a variety of civilian and military emission sources. They were supplemented by seven horn antennae arranged in an arc. These would detect and localize radar transmissions. This combination would allow coverage of the entire earth below as the orbital module passed over the earth's surface. Given that China had not previously flown a major ELINT satellite, this was an enormous leap in Chinese military surveillance from space. Each orbital module remained in space as long as eight months after the other modules return to earth. That means the orbital modules of the Shenzhou spacecraft have been scanning the earth 90% of the time, day in and day out, since Shenzhou 3 was launched in March 2002. Data was dumped in ten-minute bursts when the spacecraft pass over Miyun, near Beijing. These missions would have given China's equivalent to the American National Security Agency an excellent introduction into capabilities and problems in flying an operational ELINT satellite over a variety of targets and seasons of the year. The main objective, as was the case for low-altitude Soviet systems, would be to keep track of the US Navy, particularly carrier groups. Observations by Shenzhou 4 during the Iraq War would have been an intelligence windfall for the Chinese. Shenzhou 5's equipment included an imaging reconnaissance package. This consisted of two cameras with an aperture of 500 - 600 mm. 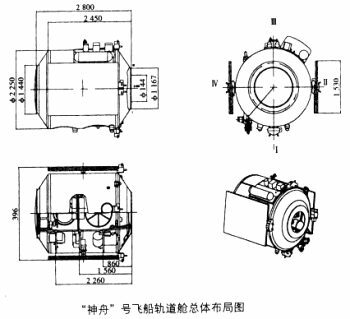 The close-look camera was mounted in the equipment pallet at the nose of the spacecraft in a rectangular housing, 0.900 m x 1.268 m x 0.86 m. Zhang Houying of the Chinese Academy of Sciences gave the ground resolution of this close-look CCD camera as 1.6 m. The other camera was mounted in the porthole above the orbital module's main hatch. The use of two differing cameras indicated a hyper-spectral, multi-resolution, combination mapping/close-look system. Shenzhou 6, with a longer-duration crew of two, dispensed with the forward equipment pallet with the close-look camera, but retained the other camera and rectangular external payload package. Another instrument package was mounted aft of the nose. Shenzhou 7, the first EVA mission, differed from earlier missions in having its solar panels, 16 thrusters, and all other sub-systems used for independent flight removed. Additions for the EVA role included five gas bottles (mounted on the forward end of the orbital module), two external cameras, handrails, and a space exposure experiment that was retrieved by the astronauts. In addition, a subsatellite, weighing 40 kg, and with diameter of 40 cm, was mounted at the top of the orbital module. 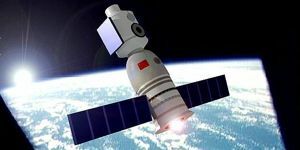 Released after the EVA, it relayed back images of Shenzhou 7 from close range, then backed to a distance of several kilometers, testing network technology with the Shenzhou and the orbital module after the deorbit of Shenzhou 7. Shenzhou 8 and subsequent missions have an EPAS-type universal docking mechanism fitted to the forward end of the capsule. All other external payloads seem to be eliminated, available mass being needed for the additional external hatch forward, the docking collar, docking mechanism, and avionics, antennae, lasers, and other components of the rendezvous and docking systems. A Central Terminal Unit in the orbital module was a dual-redundant computer that controlled the spacecraft during autonomous flight. It would also automatically come on line if the primary system in the re-entry vehicle failed during manned operations. The orbital module's autonomous on-orbit tracking and control subsystem consisted of S-band transponders, telemetry equipment and antennae. Thermal control of the module was via external louvers. Orbital module power was provided by two solar panels, each in two section, with a total area of 12.24 square meters. These charged nickel-cadmium batteries within the module for power when in the earth's shadow. Four groups of four 5-N thrusters may be mounted at the base of the orbital module. These provided an autonomous attitude control and maneuvering capability to the orbital module when in free flight. They also presumably could serve as a backup to the main orientation system in an emergency. The system used hydrazine monopropellant, pressure-fed at 23 Mpa from a 7-litre titanium cold gas tank. The thrusters were plumbed into redundant groups. Habitable Volume: 8.00 m3. RCS Coarse No x Thrust: 16 x 5 N. Electric System: 1.20 kWh. Electric System: 0.50 average kW. Gross mass: 1,500 kg (3,300 lb). Height: 2.80 m (9.10 ft). Diameter: 2.25 m (7.38 ft). Span: 10.40 m (34.10 ft). Crew Size: 3. Habitable Volume: 14.00 m3. RCS Coarse No x Thrust: 16 x 150 N. RCS Fine No x Thrust: 32 x 5 N. Spacecraft delta v: 380 m/s (1,240 ft/sec). Electric System: 3.50 kWh. Electric System: 1.45 average kW. Shenzhou - Divine Military Vessel As the first Chinese astronauts rocket into orbit, their main concern will be completion of an ambitious programme of military experiments. Shenzhou 6 FAQ! Quick facts on the Shenzhou 6 mission. Shenzhou RV Chinese manned spacecraft module. Operational, first launch 1999.11.19. The re-entry vehicle was conceptually based on the Soyuz, but was not a copy. Shenzhou OM Chinese manned spacecraft module. The orbital module provided quarters for the crew during the space mission, and could be fitted out with different internal and external equipment according to mission requirements. Shenzhou 5 First Chinese man in space. Highly conservative mission. Single astronaut stayed in the re-entry capsule for the entire 21-hour mission, and did not enter the orbital module. Shenzhou 6 China's second manned mission took two astronauts into space for nearly five days, and featured use by a crew of the Shenzhou orbital module for the first time. Shenzhou 7 First Chinese EVA. First Chinese three-crew spaceflight. Third Chinese manned space mission. The Shenzhou was flown with the full complement of three crew and astronaut Zhai conducted China's first spacewalk. 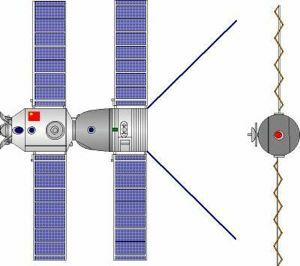 Chinese Space Station In 2009-2011 Chinese authorities announced firm plans to assemble a 60 metric ton, three-module space station by 2020. This replaced earlier plans for a 20 metric-ton single-module laboratory. Tiangong Chinese man-tended space laboratory. A series of three of these laboratories were to visited by a series of Shenzhou manned spacecraft between 2011 and 2018. 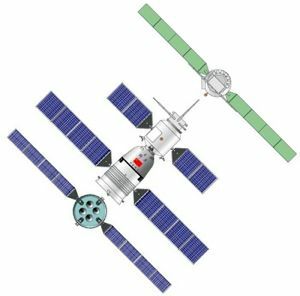 The 8.6-ton design was also the basis for the 13-ton cargo carrier for resupply of both Tiangong and the Chinese multi-module space station after 2020. Shenzhou 9 First Chinese EVA. Fourth Chinese manned space mission. First Chinese space station mission. First Chinese woman in space. The Shenzhou was flown with the full complement of three crew and docked with the Tiangong space station. Shenzhou 10 Docked with Tiangong-1 spacelab on 13 June at 05:11 GMT. Undocked and performed a manual redocking on 23 June. Undocked on 25 June at 21:07 GMT and landed in Inner Mongolia on 26 June at 00:07 GMT. Shenzhou 11 Shenzhou 11 docked two days after launch, at 19:24 GMT on October 18, with the Tiangong-2 orbital laboratory to begin a month-long mission. The astronauts completed work on November 17 and undocked in Shenzhou-11 at 04:41 GMT. Shenzhou 11 landed near Zhurihezen in Inner Mongolia province at 05:59 GMT. Tianzhou Chinese space station cargo resupply ship. 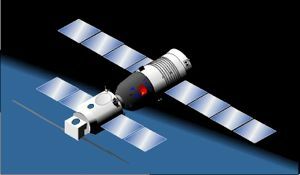 Designed to resupply the large multi-module Chinese space station, it began operations with the Tiangong space laboratory in 2017, years in advance of the assembly of the larger space laboratory. Family: Chinese Manned Spacecraft, Manned spacecraft, New Generation Crewed. Country: China. Spacecraft: Shenzhou SM, Shenzhou RV, Shenzhou OM. Flights: Shenzhou 5, Shenzhou 6, Shenzhou 7. 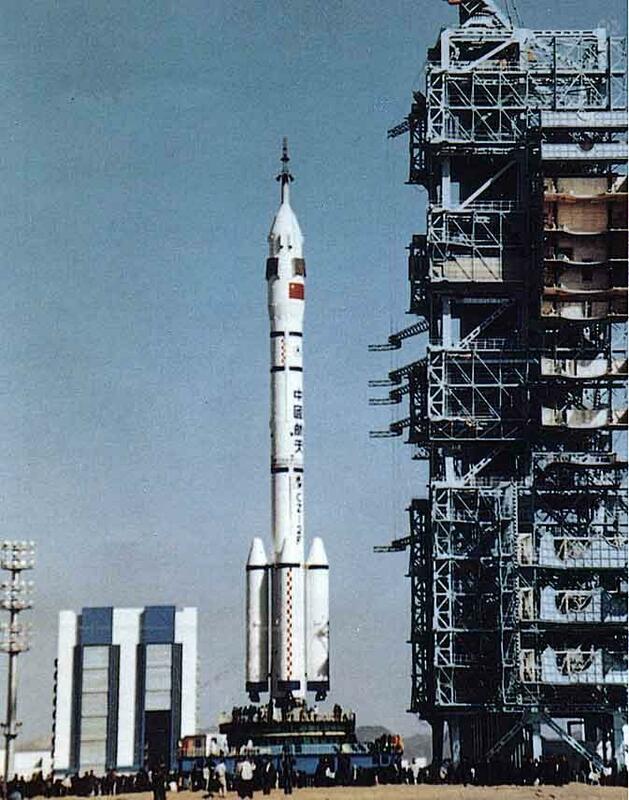 Launch Vehicles: Chang Zheng 2F. Propellants: N2O4/MMH. Launch Sites: Jiuquan, Jiuquan SLS. Agency: CAST, CASC. Bibliography: 110, 1791, 2, 286, 296, 424, 425, 434, 460, 530, 552, 554, 6870, 13087, 13088. 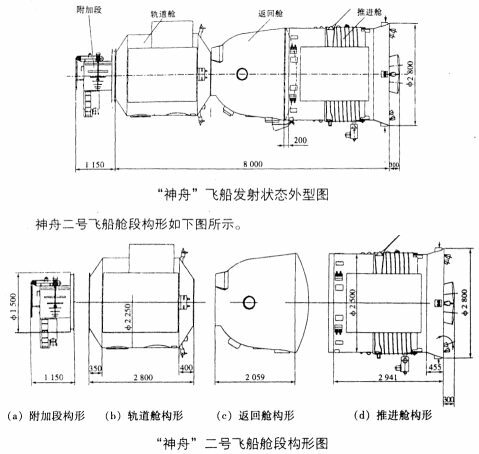 The configuration of the Shenzhou orbital module, Shenzhou 1 to 8. 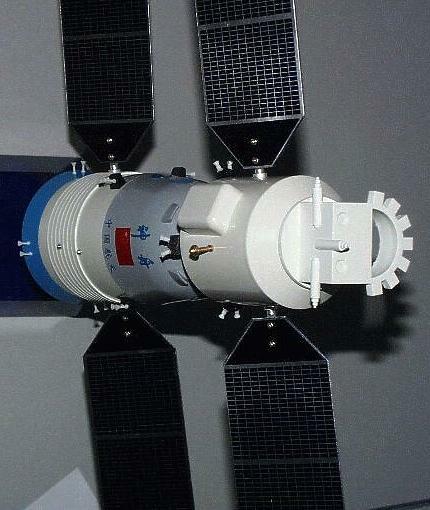 View of a 1/40 scale module of Shenzhou at the Chinese Astronautical Technology Research Group. Excluding the triangular sections, the lower solar panels of the service module measure 2.0 m x 7.5 m. Those of the orbital module are 2.0 m x 3.4 m. This indicates that the complete spacecraft can generate three times more power than Soyuz, providing an average of over 1.5 kW of electricity. In autonomous flight the orbital module would generate over 0.5 kW average. 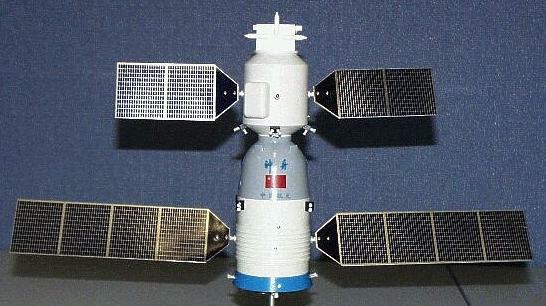 Forward view of Shenzhou model. Notice the unique configuration of the instrument pallet at the forward end; the arrangement of the reaction control thrusters at the base of the orbital module, which allow autonomous orientation and possibly manoeuvre of the module in orbit; and the rectangular package mounted opposite the entry hatch. The service module measures 2.2 m diameter x 2.8 m long. The complex equipment arranged at the top of the module is 0.95 m x 1.3 m and 0.8 m long. The semi-circular ring has a 1.1 m inner diameter and seems to provide mounting for rectangular instruments or processing samples around its exterior. The three perpendicular 0.4 m extendible probes are of uncertain purpose. They may be instrument booms; a part of the orientation system; or part of a docking system. Extendible booms were explored by the United States as a docking device for the Apollo spacecraft. It was expected that Shenzhou would have a Russian-style androgynous docking system at the forward end of the orbital module. It may be that the current model instead provides an external instrument pallet for experiments, which could be replaced on eventual station ferry missions with a docking system. View of the 'bottom' of the Shenzhou model. Noteworthy, from left to right: probable orientation instruments (horizon, ion flow and/or stellar/sun sensors) at the middle of the service module; the robust pylons supporting the moveable solar panels; the thruster groups at the centre of gravity of the spacecraft, below the re-entry capsule, which would be used for rolling the spacecraft and for horizontal / vertical translation manoeuvres; the blue patch on the re-entry module (meaning unclear); the four groups of four thrusters at the base of the orbital module, which would provide auxiliary propulsion for the spacecraft and autonomous propulsion for the orbital module after separation; the white patch on the orbital module, indicating the entry hatch location; the forward porthole in the orbital module. The re-entry capsule is 2.4 m in diameter at the base, and, 2.0 m long (excluding the heat shield). This compares to 2.17 m diameter x 1.90 m for the Soyuz capsule. Unique view of the aft end of Shenzhou. The main propulsion system consists of four large expansion ratio main engines. Four groups of two large pitch / yaw thrusters are spaced around the inside of the flared service module skirt, with complementary groups of smaller thrusters mounted on the exterior of the skirt. The radiator loops of the service module wind around the module seven times (the same number as the early Soyuz 7K-OK design). The service module is 2.8 m in diameter at the flared base, 2.5 m in diameter over the radiator section, 2.4 m in diameter at the top, and 3.05 m in length (excluding the engines). This compares to 2.72 m base diameter, 2.15 m centre diameter, and 2.60 m length for the Soyuz. View of the left side of Shenzhou. The re-entry capsule has the same aerodynamic surfaces on the upper part of the capsule, and the same cylindrical housing at the bottom as Soyuz. The capsule clearly took advantage of thirty years of Russian experience and refinement of the Soyuz capsule aerodynamic design. The purpose of the tan probe next to the rectangular housing at the top of the orbital module is not known. The arrangement of instruments arranged in an arc in the semicircular pallet mounted on the front of the orbital module is quite mysterious. View of the right side of Shenzhou. 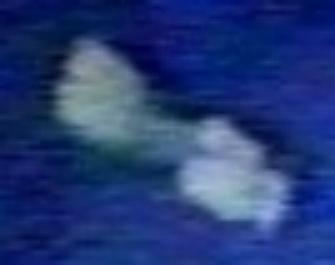 The meaning of the second blue patch on the re-entry capsule is unknown. The entry hatch at the top of the orbital module can be seen, and the extendible probes mounted 90 degrees to one another at the forward end of the orbital module. View of the top side of Shenzhou. Note the large rectangular external package on the orbital module and the three extendible probes mounted at the forward end of the orbital module. 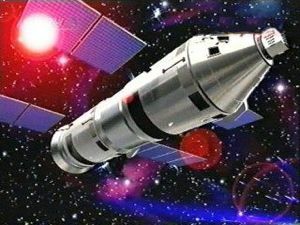 A graphic used by state television during the Shenzhou 6 was supposed to represent the spacecraft, but looks more like the planned space laboratory version. Shenzhou as it would appear in orbit. 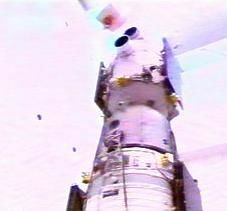 Separation of re-entry capsule from service module prior to re-entry. This is the best available picture of the Shenzhou manned spacecraft. 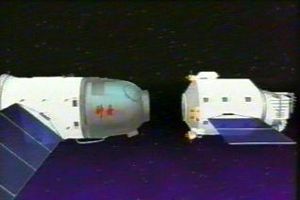 From a Chinese animation of the first mission. Photo of Shenzhou capsule at landing site. This reveals it to be the same size and shape as the Russian Soyuz capsule. View of cockpit of Shenzhou cockpit transmitted to the ground during the flight. The instruments have a Soyuz-like layout but represent more modern looking aircraft instrumentation. Shenzhou orbital module in the shop. Note the fixed solar panels, the large lateral hatch and window, and the forward docking collar. This is much larger than the Russian Soyuz module and it may be intended that they be left behind at the 921-2 space station, forming additional modules. Shenzhou capsule under is parachute. Frame from Chinese animation of Shenzhou in flight. The orbital module is separating prior to the retrofire manoeuvre. Detail of Shenzhou escape tower. Shenzhou OM in independent flight. 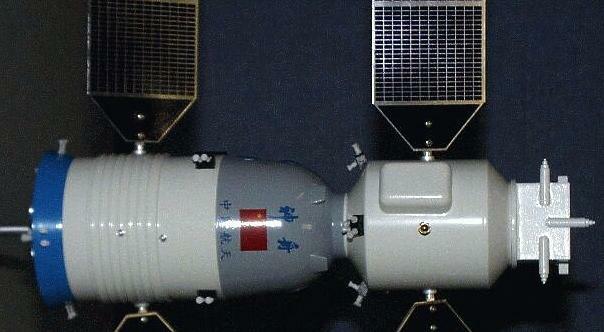 2 View of Shenzhou spacecraft. Shenzhou with ELINT booms deployed. Shenzhou, name of first Chinese manned spacecraft, as named by President Zemin. Chinese animation of Shenzhou retrofire. The orbital module has already been jettisoned. New Beijing Aerospace Directing and Controlling Center during first flight of Shenzhou. Note positioning of tracking ships in southern hemisphere. Retrofire over East Africa would lead to recovery in Inner Mongolia. Close-up of CZ-2F shroud during first mission. CZ-2F installed on launch pad. Earlier conjectural drawing of Project 921 first Chinese manned spacecraft, based on description of its layout and overall mass. 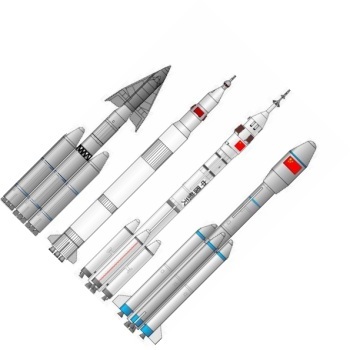 Chinese Launch Vehicles for Manned Projects. From left: Tsien Spaceplane Launcher, 1978; Project 921 Launch Vehicle, 1992; CZ-2F, 1999; CZ-2E(A), 2000. Only the last two were put into full scale development. Shenzhou 3 in the shop. 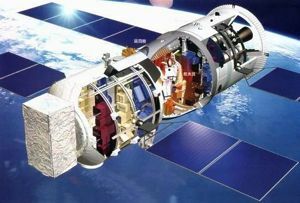 Chinese manned space programme authorised - . Nation: China. Spacecraft: Shenzhou. The Chinese leadership decided that an independent manned space program could be afforded. The Chinese National Manned Space Program was given the designation Project 921. The 921-1 manned capsule entered full scale development in 1993 and the 921-2 space station in 1999. Only preliminary work was authorised on the 921-3 reusable spaceplane. 1993 During the Year - . Development of Shenzhou manned spacecraft begins - . Nation: China. Spacecraft: Project 921-2, Shenzhou. The 921-1 manned capsule entered full scale development in 1993 and the 921-2 space station in 1999..
1998 March 19 - . Beijing Space Conference - . Nation: China. Spacecraft: Shenzhou. Chinese papers at the meeting sketched details of future planned missions. China was likely to begin its manned flights with a single orbit around Earth, and later launch its lunar 'quest'. Existing Chinese launchers had the capability to send scientific devices, but not humans, to the moon -- it could take up to eight years to design a lunar spacecraft. Feasibility studies on trips to the moon and Mars had begun. Participants called for greater international cooperation in space and the lifting of an apparent freeze on China's participation in major joint projects. They resented China's exclusion from the International Space Station. 1998 April 12 - . Timetable for Chinese Manned Flight - . Nation: China. Spacecraft: Shenzhou. A Guangzhou newspaper said that the first Chinese astronaut would fly by 2001. It also mentioned lunar and space station plans. This was the one of a series of reports about Chinese space plans of the period..
1998 April 21 - . Chinese Manned Spacecraft Launch Set for 1999 - . Nation: China. Spacecraft: Shenzhou. Preparations for the first test launch of China's first manned spacecraft were underway at the launch site, a Shanghai newspaper reported. It said the first flight would be launched in late 1999. The space cabin, telemetry system and power system had been developed in Shanghai. 1999 January 6 - . Plans for Chinese Manned Flight Officially Reported - . Nation: China. Spacecraft: Shenzhou. The official Chinese Liberation Daily reported that a Chinese manned flight would take place "by the end of this century or the beginning of the next," . This would make China the first country in more than 30 years to join the United States and Russia in the exclusive club of manned mission launchers. 1999 January 18 - . Chinese tracking fleet upgraded - . Nation: China. Spacecraft: Shenzhou. A sixteen month overhaul of China's space tracking fleet was completed in Shanghai. The upgraded ships were capable of global tracking and control with a 400-fold increase in data transfer rates. The fleet was now ready for support of the first test launch of a Chinese manned spacecraft. To support this, for the first time three Yuanwang tracking ships would be deployed in the Pacific, Indian, and Atlantic Oceans. 1999 February 12 - . 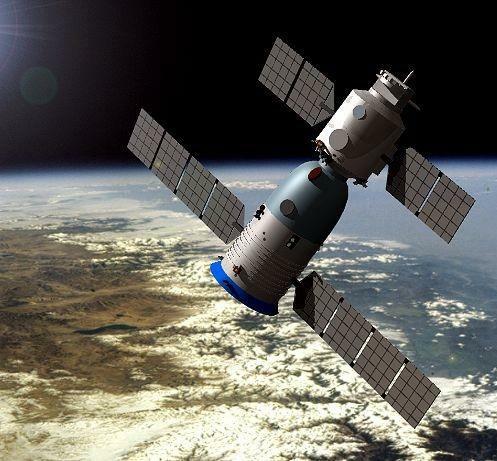 China to Test Reusable Spacecraft at the end of 2000 - . Nation: China. Spacecraft: Shenzhou. 1999 March 1 - . 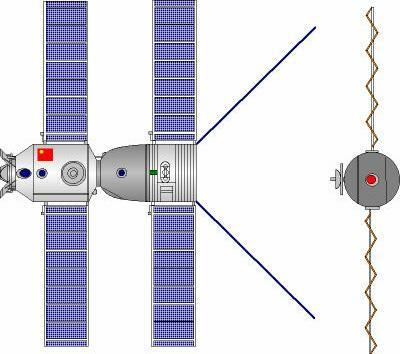 Chinese Manned Space Plans - . Nation: China. Spacecraft: Shenzhou. Zhang Heqi, the chief astronomer of the Chinese space program said that an earlier report regarding a Chinese 'shuttle' was incorrect - 'It is a manned spacecraft, not a shuttle'. There was to be an unmanned launch in one or two years. A manned launch would follow this test in the next few years.The first unmanned spacecraft might carry animals to pave the way for future manned flights. It was also reported that China had selected several astronaut candidates from PLA Air Force fighter pilots. 1999 March 11 - . LV Family: CZ. Launch Vehicle: Chang Zheng 2F. 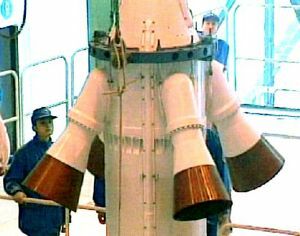 Chinese Man-Rated Launch Vehicle Test Predicted - . Nation: China. Spacecraft: Shenzhou. It was reported on the Internet that the maiden flight of a new version of the CZ-2E designed to carry a manned vehicle would be made by mid-1999..
1999 May 1 - . LV Family: CZ. Launch Vehicle: Chang Zheng 2F. Manned Program Delayed - . Nation: China. Spacecraft: Shenzhou. Far eastern newspapers reported an accident at Jiuquan Launch Center late May 1999. It was said that a fuel depot exploded, resulting in casualties and delaying the first manned vehicle launch originally scheduled for October..
1999 June 9 - . LV Family: CZ. Launch Vehicle: Chang Zheng 2F. CZ-2F Photograph Appears on the Internet - . Nation: China. Spacecraft: Shenzhou. A photograph of the CZ-2F manned spacecraft launch vehicle and its vertical assembly building was posted anonymously on the Internet. 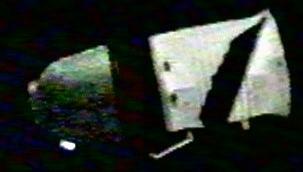 It was said to have been taken in May 1998 at the Jiuquan launch site by a contruction contractor. Some believed the photograph to be a phony but events later proved it to be real and a deliberate leak. 1999 July 11 - . Project 921-2 Go-Ahead - . Nation: China. Spacecraft Bus: Shenzhou. Spacecraft: Project 921-2. China initiated the second phase of the National Manned Space program - Project 921-2. Phase 2 would focus on a manned 'space lab' and related key technologies. A China Academy of Science research team, including six subgroups on specific topics, was established in February 1999 to issue a requirements document. The new Shanghai Institute for Biological Sciences was also involved. 1999 July 16 - . Chinese Manned Program Announcement - . Nation: China. Spacecraft: Shenzhou. Zhang Lihui, Director of Research and Development at the China Aerospace Science and Technology Corporation (CASC), said that a development plan for manned-space flight technology was issued by the Chinese State Council in 1992 and that China was on track to launch a manned space flight by early in the next century. This was the first direct official acknowledgement of such a program. 1999 July 18 - . New Tracking Ship Joins Yuan Wang Fleet - . Nation: China. Spacecraft: Shenzhou. A new space tracking ship, Yuan Wang 4, was delivered to China Satellite Launch and Tracking Control General by the China State Shipbuilding Corporation. This was the fourth tracking ship in China's Yuan Wang space tracking fleet. The Yuan Wang 4 tracking ship was converted from the scientific survey ship Xiang Yang Hong 10. The announcment also contained the second announcement that the fleet would deploy for a major new operation (a test of a manned spacecraft) within the next year. The Yuan Wang 4 was 156.09 m long, 20.6 m wide along the mold-line, and had a displacement of 10,895 tons. 1999 November 19 - . 22:30 GMT - . Launch Site: Jiuquan. Launch Complex: Jiuquan SLS. LV Family: CZ. Launch Vehicle: Chang Zheng 2F. Shenzhou - . Mass: 7,600 kg (16,700 lb). Nation: China. Agency: CASC. Manufacturer: CALT. Class: Manned. Type: Manned spacecraft. Spacecraft: Shenzhou. Duration: 0.88 days. Decay Date: 1999-11-20 . USAF Sat Cat: 25956 . COSPAR: 1999-061A. Apogee: 315 km (195 mi). Perigee: 195 km (121 mi). Inclination: 42.60 deg. Period: 89.60 min. The unmanned first test flight of a prototype of the Chinese Project 921-1 spacecraft took place 49 days after the planned date of October 1, 1999. Shenzhou separated from its launch vehicle and went into orbit about ten minutes after lift-off. The spacecraft was controlled from the new Beijing Aerospace Directing and Controlling Centre. The spacecraft did not manoeuvre during the flight. The first attempt to return the spacecraft to earth came on orbitt 12, but the retrofire command would not be accepted by the spacecraft's computer. A retry on the next orbit also failed. The Yuanwang-3 tracking ship off the coast of Namibia picked up the spacecraft's signal at 18:49 UT, and commanded retro-fire. This time the spacecraft accepted the command, which probably saved the entire program. The spacecraft passed out of range of the tracking ship nine minutes later. Its trajectory arced over Africa, skimmed the coast of the Arabian peninsula, and then over Pakistan, before re-entering over Tibet. Following re-entry, the drogue chute deployed at an altitude of 30 km with the capsules soft-landing rockets firing 1.5 m above the ground. The capsule landed at 41 deg N, 105 deg E, (415 km East of its launch pad and 110 km north-west of Wuhai, Inner Mongolia), at November 20 19:41 UT. The spacecraft had completed 14 orbits of the earth in 21 hours and 11 minutes. 1999 November 30 - . Shenzhou Chief Designer Revealed - . Nation: China. Related Persons: Qi Faren. Spacecraft: Shenzhou. Qi Faren, the General Designer of the Shenzhou had participated in the design of China's first satellite and was appointed the general designer of Chinese spacecraft in 1992. During the ensuing seven years, Qi directed and co-ordinated his thousand-strong team to '...make a breakthrough in China's manned space travel technology. We are now losing no time in furthering our research. We plan to send humans into space as soon as possible'. 2000 January 4 - . Chinese tracking fleet returns - . Nation: China. Spacecraft: Shenzhou. The Chinese space tracking ship "Yuanwang 3" has returned to the Jiangnan Port of Nanjing in East China's Jiangsu Province after successfully completing its mission with China's first experimental spacecraft "Shenzhou." The other three ships, Yuanwang 1, 2 and 4, returned from their missions earlier. During their 259-day voyage, the four ships traveled some 62, 000 nautical miles and experienced some heavy seas while tracking and communicating with the "Shenzhou" for a total of 150 minutes. (People's Daily) --- note the December 12 news (all 4 ships return) on this site is not precise. 2000 December 13 - . China Tracking Station in Namibia - . Nation: China. Spacecraft: Shenzhou. China and Namibia signed an agreement to build a tracking, telemetry and space research station (TTST) in Namibia to support China's manned space program. The station would cover an area of 150 by 85 metres and consist of an administration building and two antennae. 2001 January 6 - . Yuan Wang deployed for Shenzhou 2 flight - . Nation: China. Spacecraft: Shenzhou. China reported that the four Yuan Wang tracking ships celebrated the New Year on remote oceans. Yuan Wang 1 and 2 were in the Pacific Ocean, Yuan Wang 4 had arrived in the Indian Ocean, and Yuan Wang 3 was en route to the Atlantic Ocean..
2001 January 9 - . 17:00 GMT - . Launch Site: Jiuquan. Launch Complex: Jiuquan SLS. LV Family: CZ. Launch Vehicle: Chang Zheng 2F. Shenzhou 2 - . Mass: 7,400 kg (16,300 lb). Nation: China. Agency: CASC. Manufacturer: CALT. Class: Manned. Type: Manned spacecraft. Spacecraft: Shenzhou. Duration: 6.77 days. Decay Date: 2001-01-16 . USAF Sat Cat: 26664 . COSPAR: 2001-001A. Apogee: 345 km (214 mi). Perigee: 330 km (200 mi). Inclination: 42.60 deg. Period: 91.30 min. The second unmanned test flight of the Shenzhou manned spacecraft design carried a monkey, a dog and a rabbit in a test of the spaceship's life support systems. 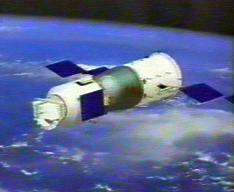 Shenzhou 2 was the first test of an all-up flight model of the spacecraft, with a functioning orbital module. It was also the most ambitious space science laboratory ever launched by China. It carried 64 scientific payloads: 15 in the re-entry module, 12 in the orbital module and 37 on the forward external pallet. These included a micro-gravity crystal growing device; life sciences experiments with 19 species of animals and plants, cosmic ray and particle detectors; and China's first gamma ray burst detectors. The launch was originally scheduled for January 5, but the second stage of the launch vehicle was dented by an access platform while being prepared for roll-out in the vehicle assembly building. This caused several days of delay until it was cleared for flight. Shenzhou 2 made three orbit-raising manoeuvres during its flight, reaching a 330 x 345 km orbit by the end of the initial phase of the mission. Ninety minutes before landing the orbital module depressurised, and the spacecraft went briefly out of control. However this was regained after venting of the atmosphere from the module ended. The descent module and service modules separated from the forward orbital module and external pallet normally. After retrofire by the service module, it separated and the descent module landed at 11:22 GMT on January 16 in Inner Mongolia. Lack of post-recovery photographs led to speculation that the recovery may not have been completely successful. 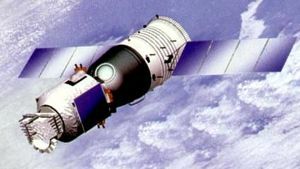 The Shenzhou orbital module had its own solar panels and remained operational in orbit, conducting scientific experiments. It was actively controlled for six months, maneuvering in orbit several times (reaching a final orbit of 394 x 405 km). It then was allowed to decay and reentered the atmosphere at 09:05 GMT on August 24, 2001. The reentry point was near 33.1 deg S in latitude and 260.4 deg E in longitude, over the western Pacific Ocean between Easter Island and Chile. 2001 November 2 - . Namibia Tracking Station Completed - . Nation: China. Spacecraft: Shenzhou. China completed construction of a tracking, telemetry and command station in Swakopmund, Namibia, Africa..
2002 March 25 - . 14:15 GMT - . Launch Site: Jiuquan. Launch Complex: Jiuquan SLS. LV Family: CZ. Launch Vehicle: Chang Zheng 2F. Shenzhou 3 - . Mass: 7,800 kg (17,100 lb). Nation: China. Agency: CAS. Manufacturer: CALT. Class: Manned. Type: Manned spacecraft. Spacecraft: Shenzhou. Duration: 6.78 days. Decay Date: 2002-04-01 . USAF Sat Cat: 27397 . COSPAR: 2002-014A. Apogee: 379 km (235 mi). Perigee: 374 km (232 mi). Inclination: 42.40 deg. Period: 92.10 min. 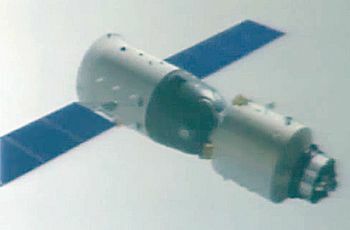 The third unmanned test of the Shenzhou spacecraft was delayed almost three months when a defective connector was found on the booster after roll-out to the pad in January 2002. The vehicle was disassembled, and all suspect connectors were replaced. The stand-down also revealed ten previously undetected defects in the space capsule. The spacecraft, the first all-up flight model with a functioning (but deactivated) launch escape system, was finally launched and placed into an initial 197 x 326 km x 42.4 deg orbit at 1425 UTC. At about 2120 UTC Shenzhou used its own engine to raise its orbit to 332 x 337 km. 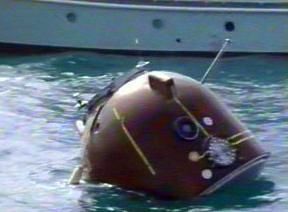 The capsule included a dummy astronaut instrumented to monitor life support systems. The descent module returned to Earth on April 1 at 0851 UTC, landing in Inner Mongolia. The orbital module remained in orbit to carry out further experiments, finally being deorbited on 12 November 2002. The spacecraft carried 44 scientific payloads, including a medium-resolution imaging radiometer developed by Chinese Academy of Sciences, installed on the instrument pallet atop the orbital module. 2002 December 29 - . 16:49 GMT - . Launch Site: Jiuquan. 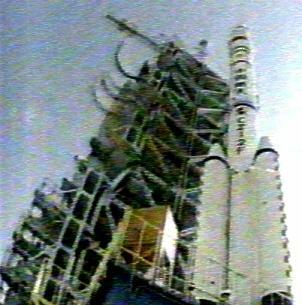 Launch Complex: Jiuquan SLS. LV Family: CZ. Launch Vehicle: Chang Zheng 2F. Shenzhou 4 - . Mass: 7,794 kg (17,182 lb). Nation: China. Agency: CAS. Manufacturer: CALT. Class: Manned. Type: Manned spacecraft. Spacecraft: Shenzhou. Duration: 6.77 days. Decay Date: 2003-01-05 . USAF Sat Cat: 27630 . COSPAR: 2002-061A. Apogee: 337 km (209 mi). Perigee: 331 km (205 mi). Inclination: 42.40 deg. Period: 91.20 min. Final unmanned test of the Shenzhou spacecraft. First night launch of the CZ-2F was viewed by Party leaders on a very cold but clear night. The spacecraft carried fifty-two science payloads in four main areas: microwave Earth observation, space environment monitoring, microgravity fluid physics, and biological technology research. The spacecraft's reentry capsule was successfully recovered on 5 January 2003 at 1116 UT. The Chinese released the news and photographs of the capsule in the dusk snow only an hour later. The landing site was 40 km from Hohhot (40.51deg N, 111.38 deg E). As in prior missions, the orbital module continued in orbit. Chinese astronauts trained on the actual flight hardware before the launch and it was officially announced that this successful mission set the stage for a first Chinese manned spaceflight in the second half of 2003. Western observors noted that the orbit and ground track allowed launch of a second rendezvous vehicle, an indication of future manned space station missions. Shenzhou 4 carried 52 scientific payloads including a microwave radiometer using a reflector antenna, installed on top of the orbital module. 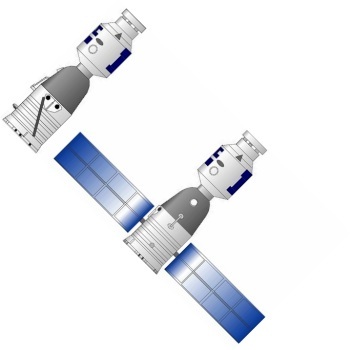 Shenzhou 5 Orbital Module - . Mass: 1,100 kg (2,400 lb). Nation: China. Agency: SISE. Class: Surveillance. Type: Military surveillance satellite. Spacecraft Bus: Shenzhou. Spacecraft: Shenzhou OM. Decay Date: 2004-05-30 . USAF Sat Cat: 28049 . COSPAR: 2003-045G. Apogee: 347 km (215 mi). Perigee: 338 km (210 mi). Inclination: 42.40 deg. Period: 91.40 min. The Shenzhou 5 orbital module was essential an unmanned military reconnaisance satellite. It was never entered by the astronaut during the mission, and was equipped with two high resolution (1.6 m) surveillance cameras. It was expected to operate until at least spring 2004. 2005 October 16 - . Shenzhou 6 lands - . Nation: China. Related Persons: Fei Junlong, Nie Haisheng. Flight: Shenzhou 6. Spacecraft: Shenzhou. Shenzhou 6 soft landed within sight of the recovery forces at 04:32:50 local time..
2008 September 25 - . 13:10 GMT - . Launch Site: Jiuquan. Launch Complex: Jiuquan SLS. LV Family: CZ. Launch Vehicle: Chang Zheng 2F. Shenzhou 7 - . Crew: Jing Haipeng, Liu Buoming, Zhai Zhigang. Mass: 7,840 kg (17,280 lb). Nation: China. Related Persons: Jing Haipeng, Liu Buoming, Zhai Zhigang. Agency: SISE. Class: Manned. Type: Manned spacecraft. Flight: Shenzhou 7. Spacecraft: Shenzhou. Duration: 2.85 days. Decay Date: 2008-09-28 . USAF Sat Cat: 33386 . COSPAR: 2008-047A. Apogee: 336 km (208 mi). Perigee: 329 km (204 mi). Inclination: 42.40 deg. Period: 91.20 min. Third Chinese manned space mission. The crew consisted of Zhai Zhigang, backup astronaut for China's first manned space mission; and Liu Buoming and Jing Haipeng, backups for the second mission. The astronauts demonstrated the capability of the Shenzhou spacecraft to carry its full complement of three crew for the first time. Zhai, wearing a Chinese-developed Feitian space suit, emerged from the orbital module of the Shenzhou and became China's first astronaut to conduct a spacewalk. Liu, wearing a proven Russian Orlan spacesuit, remained in the depressurized orbital module, ready to assist Zhai in an emergency. A subsatellite, weighing 40 kg, was released after the EVA, and relayed back images of Shenzhou 7 from close range to a distance of several kilometers. The crew returned safely to earth in a pinpoint landing in Outer Mongolia, carried live on television. The orbital module remained in space, conducting space network experiments with the subsatellite. 2011 October 31 - . 21:58 GMT - . Launch Site: Jiuquan. Launch Complex: Jiuquan SLS. LV Family: CZ. Launch Vehicle: Chang Zheng 2F. Shenzhou 8 - . Mass: 7,800 kg (17,100 lb). Nation: China. Class: Manned. Type: Manned spacecraft. Spacecraft: Shenzhou. Duration: 16.57 days. Decay Date: 2011-11-17 . USAF Sat Cat: 37859 . COSPAR: 2011-063A. Apogee: 338 km (210 mi). Perigee: 328 km (203 mi). Inclination: 42.80 deg. Period: 91.20 min. Unmanned test of Shenzhou manned spacecraft. Automatically docked with Tiangong 1 space laboratory at 17:28 GMT on 2 November. Undocked on 14 November at 11:27 GMT, backed off 140 m, and conducted a second successful automatic docking at 11:53 GMT. Undocked the final time at 10:30 GMT on 16 November and landed in China at 11:32 GMT on 17 November. 2012 June 16 - . 10:37 GMT - . Launch Site: Jiuquan. Launch Complex: Jiuquan SLS. LV Family: CZ. Launch Vehicle: Chang Zheng 2F. Shenzhou 9 - . Mass: 7,800 kg (17,100 lb). Nation: China. Class: Manned. Type: Manned spacecraft. Spacecraft: Shenzhou. Duration: 12.64 days. Decay Date: 2012-06-29 . USAF Sat Cat: 38461 . COSPAR: 2012-032A. Apogee: 355 km (220 mi). Perigee: 334 km (207 mi). Inclination: 42.80 deg. Period: 91.40 min. First docking of a manned Shenzhou spacecraft with the Tiangong space laboratory. The crew was commanded by Jing Haipeng (who flew on Shenzhou 7) with rookies Liu Wang and Liu Yang, the first woman to fly in a Chinese space crew. At about 14:40 GMT on June 17 the ship maneuvered from 261 x 315 km to 315 x 326 km. 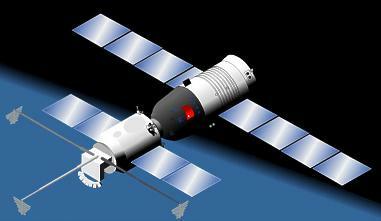 On June 18 at 06:08 GMT the Shenzhou 9 spaceship docked with the Tiangong 1 spacelab. At 09:10 GMT the three astronauts opened the TG-1 hatch and entered the lab for the first time. The Shenzhou 9 crew undocked from Tiangong 1 at 030:9 GMT on June 24 and backed off to 300 m, then reapproached first to 140 m and then to a manually controlled redocking carried out by Liu Wang at 04:49 GMT. On June 28 at 01:22 GMT Shenhzhou 9 undocked again for the last time; a brief manual re-rendezvous to 140 m was carried out. Return to Earth came on June 29 with orbital module seperation at about 01:16 GMT, retrofire at 01:17 GMT, service module sep at 01:38 GMT and landing at 02:02 GMT in Siziwangqi, a district in Ulanqab prefecture in Inner Mongolia. 2013 June 11 - . 09:38 GMT - . Launch Site: Jiuquan. Launch Complex: Jiuquan SLS. LV Family: CZ. Launch Vehicle: Chang Zheng 2F. Shenzhou 10 - . Crew: Nie Haisheng, Wang Yaping, Zhang Xiaoguang. Mass: 7,800 kg (17,100 lb). Nation: China. Class: Manned. Type: Manned spacecraft. Spacecraft: Shenzhou. Duration: 14.60 days. Decay Date: 2013-06-25 . USAF Sat Cat: 39179 . COSPAR: 2013-029A. Apogee: 337 km (209 mi). Perigee: 333 km (206 mi). Inclination: 42.78 deg. Period: 91.23 min. 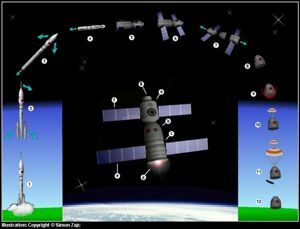 Docked with the Tiangong-1 spacelab on June 13 at 05:11 GMT. On June 23 the crew carried out a redocking exercise. They undocked Shenzhou 10 from Tiangong at 00:26 GMT, backed away from the station, and redocked with it at 02:00 GMT. On June 24 the crew undocked for the final time, made a flyaround of the Tiangong station, and then prepared to return to Earth. The deorbit burn was at about 23:23 GMT Jun3 25. The capsule landed in China at 00:07 GMT June 26, at 42.33N 111.36E. 2016 October 16 - . 23:30 GMT - . Launch Site: Jiuquan. Launch Complex: Jiuquan SLS. LV Family: CZ. Launch Vehicle: Chang Zheng 2F. Shenzhou 11 - . Crew: Jing Haipeng, Chen Dong. Mass: 7,800 kg (17,100 lb). Nation: China. Class: Manned. Type: Manned spacecraft. Flight: Shenzhou 11. Spacecraft: Shenzhou. Duration: 32.27 days. Decay Date: 2016-11-18 . USAF Sat Cat: 41812 . COSPAR: 2016-061A. Apogee: 389 km (241 mi). Perigee: 378 km (234 mi). Inclination: 42.80 deg. China launched Shenhzou 11 with astronauts Jing Haipeng and Chen Dong; two days later, at 1924 UTC Oct 18, it docked with Tiangong-2 to begin a month-long mission. The Chinese astronauts Jing and Chen completed work aboard the Tiangong-2 spacelab on Nov 17 and undocked in Shenzhou-11 at 0441 UTC. Shenzhou 11 landed near Zhurihezen in Inner Mongolia province at 0559 UTC. 2017 April 20 - . 11:41 GMT - . Launch Site: Wenchang. Launch Complex: Wenchang LC201. LV Family: CZ-NGLV. Launch Vehicle: Chang Zheng 7. Tianzhou-1 - . Nation: China. Class: Manned. Type: Manned logistics spacecraft. Spacecraft Bus: Shenzhou. Spacecraft: Tianzhou. Decay Date: 2017-09-22 . USAF Sat Cat: 42684 . COSPAR: 2017-021A. Apogee: 369 km (229 mi). Perigee: 311 km (193 mi). Inclination: 42.80 deg. Period: 92.36 min. See Tianzhou 1 (TZ 1). China's first space station cargo resupply ship. Tianzhou-1 had a mass of 12910 kg. It flew on the second Chang Zheng 7 rocket, launched from Wenchang space centre on Hainan island. Tianzhou-1 docked with the Tiangong-2 space lab, then unoccupied. This mission was mainly for technology development; the Tianzhou frieghters were to be used operationally to resupply China's future large space station. Tianzhou 1 was inserted into a 198 x 372 km x 42.8 deg initial orbit, which was then raised to 311 x 369 km. The second stage ejected the usual four motor separation covers into 200 x 550 km orbits.